Heavily impacting on tourism, fisheries and wildlife, sargassum rafts of unprecedented size can be found on Carribean shores since 2011. 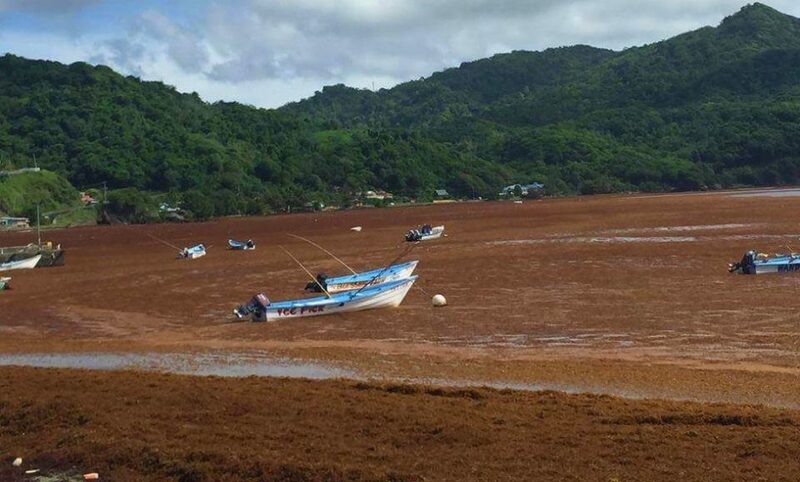 Sargassum stinks as it decomposes on beaches, blocked with several meters deep mats. Removal is time-consuming and expensive. Tourists are concerned, incoming rafts smother sea grasses and coral reefs, while fishermen struggle to get in the water. Rafts impact on fish and turtle (especially babies and nesting) populations. Sargassum (S. natans and S. fluitans) is a type of brown holopelagic seaweed, never attaching to the seafloor during its life. The plant is made of many leafy appendages, branches, and round, berry-like structures that are gas-filled (mostly by oxygen) and keep it floating on the sea surface. While seen from above sun-baked sargassum rafts look like barren, discolored oceanic detritus, they are complex and teeming with life, when they are not in sheer volume. Sargassum is at the mercy of winds and currents and it is difficult to predict which areas and beaches will be more affected. Knowing how it will drift would help reduce the negative effect of heavy sargassum rafts on local economies and prepare and support timely collection operations. Situation and forecast bulletins (frequent information on location, density and drifting trajectories) would support anticipating sargassum arrival in high touristic areas, improve planning and mitigation mobilization and improve research on the seaweed-ecosystem interaction. The normalised floating algae index (NFAI) allows to infer the presence and concentration of floating algae (supposed to belong to the sargassum species) at the surface of the ocean from optical medium-resolution sensors such as Sentinel-3/OLCI and MODIS. This algorithm, inherited from Hu, C. (2009), computes a floating algae index at the highest pixel resolution, comparing reflectance in the near infra-red to reflectance in the red part of the solar spectrum (in analogy to vegetation indexes used over land). Sargassum mats detected with Sentinel-3 OLCI data offshore Haiti. A daily sargassum mats mapping is one of the inputs for drifting simulation modelling, together with weather and surface currents data coming from Copernicus CMEMS and other sources. 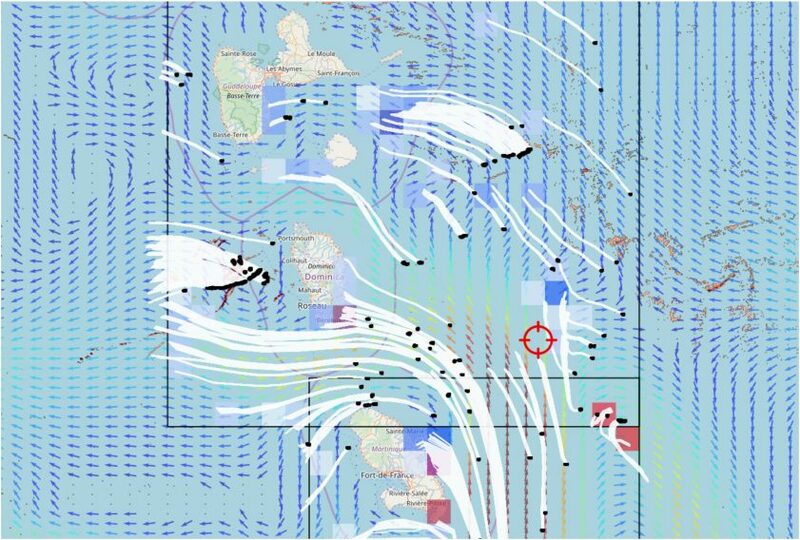 Results of drift simulation showing the initial position of sargassum detected (black dots), their estimated trajectories (white lines) and the probability grid of sargassum presence after 3 days of drift, superimposed on the ocean current forecast from CMEMS. Within the Sargassum project, a pre-operational service chain has been developed and tested in the Caribbean Seas area to provide concentration indicators and drift trajectories forecast to a number of users from Belize to Trinidad, ranging from touristic organizations to coast guard to environmental research entities. Access to the output products is granted via a user-friendly dedicated web platform. As from 5 April, access to the Sargassum web platform is free and open for two months (until mid-June) to everyone interested in following the sargassum situation in the Carribean. Live demos of the service capabilities will take place in a few forthcoming events, starting with the Living Planet Symposium 2019 in Milan, 13-19 May, to continue with Oceans 2019 in Marseille and CMEMS4OR in the Azores.